Caesar Cardini Villa (1938-1939), was his home restaurant for several years, before the restaurateur Caesar Cardini (Caesar’s Place, Original Caesar’s Place, Caesar Cardini Cafe, Tavern Hacienda, Beacon Inn, Caesar Cardini Foods) moved with his family to Los Angeles. It is now a private residence. Newspaper ad for Smailes Park, 1928. Photo, San Diego History Center. His Spanish Colonial home was built in 1931 among the citrus groves of Smailes Park, Chula Vista. Just a convenient couple miles north of the Tijuana border. All one had to do was call for reservations, head on down the “road to Hell,” and look for his signs. Caesar and brother Gaudencio Cardini’s home-cooked luncheons were 75¢ and dinners $1.00. By 1940, Caesar and his family were in Montclair, Los Angeles minding a retail liquor shop. Faithful brother Gaudencio tagged along. 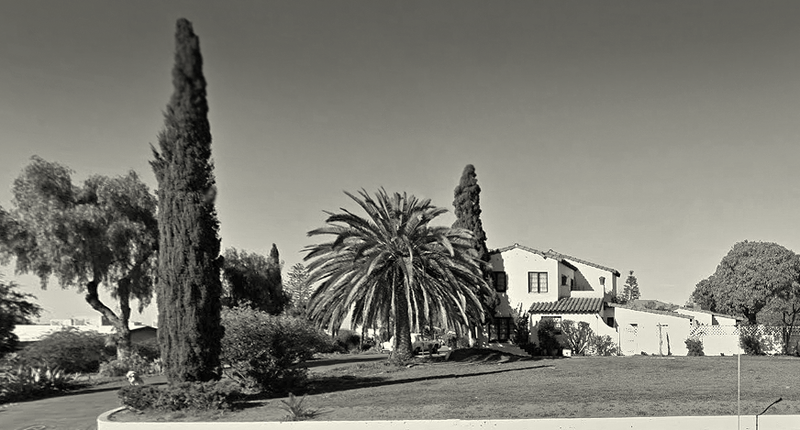 In 2012, the City of Chula Vista designated it the Caesar Cardini House, Historic Site #75. Anti-Tijuana graffiti on National Avenue, National City, 1920s. “Hundreds of thousands” is from newspaper ads and ‘Caesar Cardini opens new C.V. dining room,’ Chula Vista Star, 16 Sep 1938. “built in 1931” and “historic site #75” are from ‘Meeting of the Historic Preservation Commission, City of Chula Vista,’ agenda, 17 Apr 2013. “were in Montclair” is from 1940 United States Federal Census, Los Angeles, Los Angeles, California; Page: 10B; Enumeration District: 60-341. During Prohibition, the road leading down to Tijuana was known as — and even tagged at one point — ‘the road to hell.’ No doubt by well-meaning tea totallers. A fun read is ‘A trip to Tijuana over the road to hell,’ in The Coronado Strand, 22 Oct 1921.